Communities across London have been monitoring and changing their local areas through the use of a mapping technology developed at UCL. 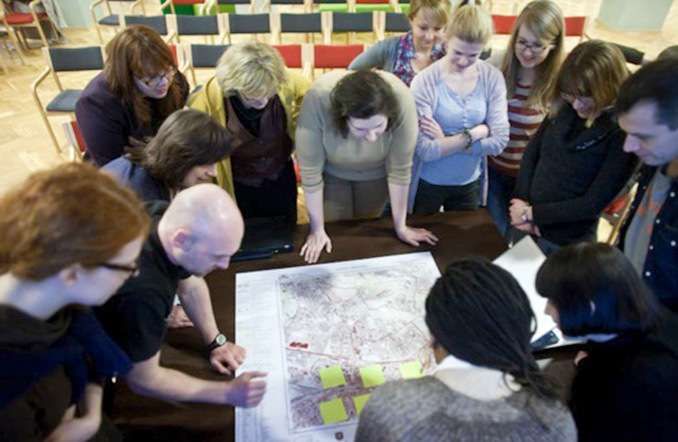 The social enterprise Mapping for Change, set up by UCL and community organisations, uses a participatory geographic information system (GIS) with communities to solve the problems that they face - from neighbourhood management to monitoring air pollution. By using mapping and geographical technologies such as GIS to collect, analyse and display information about communities' life and environment, Mapping for Change (MfC) projects have helped increase community engagement in the local environment, led to new environmental monitoring by local authorities and stimulated policy debate about noise and air pollution. For example, residents in a neighbourhood in Barking and Dagenham created 130 individual maps, which highlighted a number of areas they wanted to improve. MfC acted as a link between community groups and council departments, so when a community group organised for a previously dirty lake to be cleaned four times a year, the council parks' service allocated a budget for the clean up. An agreement was made to open the library three extra days a week and its issue figures have doubled; local street pastors use the map to identify and target anti-social behaviour hotspots; and information about crimes reported to the mapping team that were not reported to police have been passed on, helping the police develop a more accurate picture of local crime and antisocial behaviour. Another major project has assessed noise pollution and air quality on London's Pepys Estate since January 2008. The estate in Deptford suffered noise pollution from a local scrapyard, but after residents used noise meters to take measurements throughout the day and night over two months, the Environment Agency revoked the scrapyard's licence. In 2011, residents also surveyed the estate's air quality; as a result, the local authority (Lewisham) installed diffusion tubes monitoring devices at the main junctions identified by the project as having higher levels of nitrogen dioxide (NO2). Levels of NO2 in London are largely from vehicle exhausts and are also a strong indicator of the presence of other air pollutants derived from vehicle emissions. The council also installed a PM10 particulate monitoring station in the neighbourhood to monitor the local situation. Previously, the closest fixed monitoring station was just over a kilometre away. Since 2011, MfC has worked with HACAN (Heathrow Association for the Control of Aircraft Noise) and the EU-funded EveryAware project to map noise issues around the airport. Mobile phone software developed by EveryAware consortium provides a low-cost, widely available noise monitoring tool. More than 250 people in the Heathrow area are contributing data to the noise map. Following MfC's work with HACAN, in 2013 the Royal Borough of Windsor and Maidenhead started a large-scale citizen-driven noise-monitoring project using the WideNoise App leading to a participatory map that was submitted to the Airports Commission examining the need for additional UK airport capacity. This project highlighted the importance of the MfC approach to citizen science - where projects are designed with the participants rather than for them. In 2011, MfC used diffusion tubes to measure nitrogen dioxide levels at seven locations around London, with participants recruited through social media. The results showed that along main road networks NO2 levels were as much as 75% above EU guidelines; it also highlighted issues in several residential back roads used as rat-runs. In Putney, concerns raised about air quality by the Putney Society, citing the MfC findings, were successful in leveraging political support to lobby for change, leading Transport for London to introduce to the area new buses that comply with higher standards for emissions. MfC has teamed up with other London organisations to call for action on air pollution, and hosted an air pollution conference for local government and community groups in April 2013. Community groups and local authorities have taken further action, for example setting up community air quality monitoring in the Barbican in collaboration with the City of London, which started in autumn 2013 and has already identified a number of pollutant hotspots in the area. More than 100 residents have so far been involved in the project, with many hosting a diffusion tube for a year. More than half of residents said that they would change their walking routes as a result of the research; 85% reported that they felt more aware of some of the legal and technical aspects of air quality and 90% reported an improved understanding of the health impacts of air quality in London.